We pick up from all resorts NOT including Arrecife at your accomodation or the nearest pick up point no more than 2 mins walk. 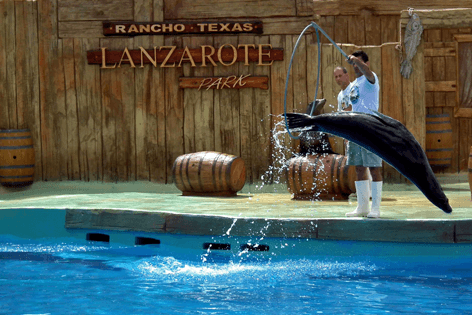 The Rancho Texas Animal Park is the only place in Lanzarote where you can experience a swim with sealions. You can enter the pool in small groups of 8 twice a day, swim with sealions and have an unique experience, you are guaranteed to have loads of fun. You will be amazed to see the bond that each trainer has with the sealions. 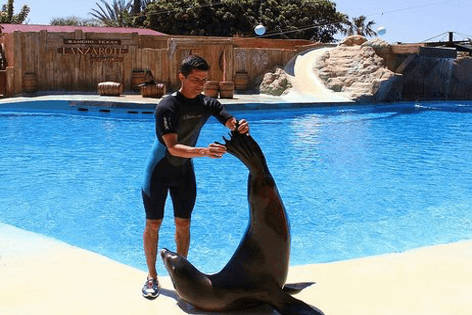 Learn loads of information about sea lions and how they live in the wild and of course take home a souvenir photo of this unforgettable day. You also get an added bonus of a photo opportunity with the sea lions which you can collect from the gift shop before you leave and is included in the price. A beautiful way to relive memories and hold onto for ever. 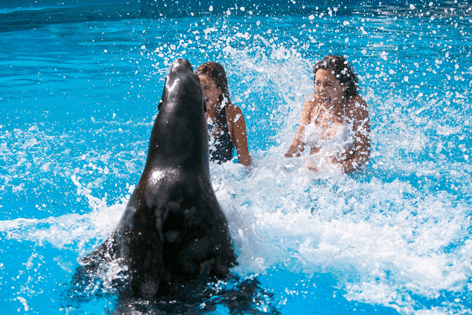 Swim with sealions Rancho Texas is something you can do as a couple or with family and friends. Bring a towels with you, You are given wetsuits, shoes and life jacket, there is locker and shower facility too. 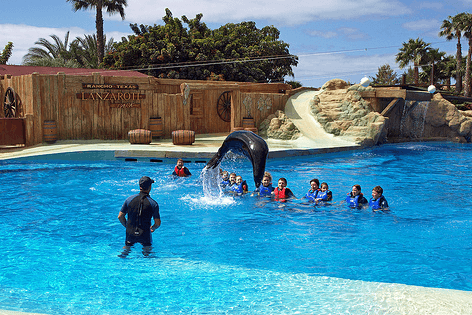 If you Swim with sealions in the UK would cost you around €117, whereas at Rancho Texas it is just €80.00 pp for adults and €72.00 pp for kids (up to 12) which is cost-effective. Great value for money. 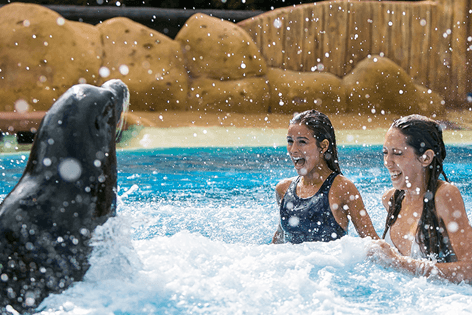 After you swim with sealion, you can spend the rest of the day enjoying other park activities like the Splash Zone with pools to cool off and slides. Don’t forget to bring extra clothes, towels and sunscreen so you enjoy the waterpark the most. It also has two twisting slides which cascade down from the mountains, which is sure to get you wanting to try again and again. Also try Pony Ride, Canoeing, interact with the youngest ones like rabbits, goats, donkeys or horses within an environmental education program. PARK ENTRANCE TICKETS ARE INCLUDED IN THIS PRICE, so you can enjoy the rest of the park after the show. It is great to see the other shows like Birds of Prey show, Dolphins and the Parrot show too which are all incuded in the day. We recommend you Book online at least 24 hrs in advance, because this show is always full and sells out quickly. Guaranteed highlight of your holiday and highly recommended.